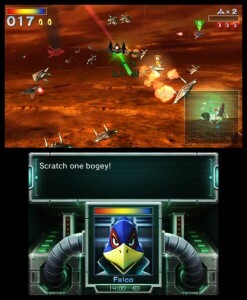 Continuing the trend of re-purposing Nintendo 64 titles for a DS system (much like Super Mario 64 and Ocarina of Time before it), along comes Star Fox 64 to join the handheld remake club. Despite its popularity at its peak during the 90s, Star Fox has basically faded into obscurity as a franchise, only rearing its head to make Super Smash Bros. cameos and sequels that for one reason or another just can’t seem to hit the mark. It’s a shame too, as the original SNES release showed off what the Super FX chip can do, and the N64 followup introduced console gamers to force feedback by way of the Rumble Pak for the first time. Since then, the franchise has had two outings on the Gamecube: Star Fox Adventures which was essentially a Zelda clone set in space and Star Fox Assault which removed the branching paths and added on foot missions. There was also the DS title, Star Fox Command, which put Fox back in the cockpit, but forced players to maneuver using the touchscreen. While I personally felt that they were all solid titles, they also were so far removed from the original vision of the franchise that I just couldn’t enjoy them as much as I did their predecessors. 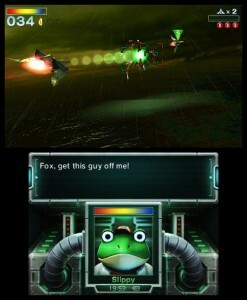 To this day, Star Fox 64 remains my favorite in the franchise and all the more reason I was nervous for this 3DS remake. Are they going to force me to use gyro controls? How about the touchscreen? Will they do something else to ruin it? The cynic in me couldn’t escape these questions as the release date got closer and closer. Now that it’s out, it’s time to discover if Star Fox 64 3D can do the N64 original, and the franchise, the justice it deserves. Five years ago, General Pepper, the leader of Corneria, banishes the scientist Andross far across the galaxy to the planet of Venom for his irresponsible production and use of biological weaponry. Andross doesn’t take this lying down, however, and word of suspicious activity makes its way back to Corneria. 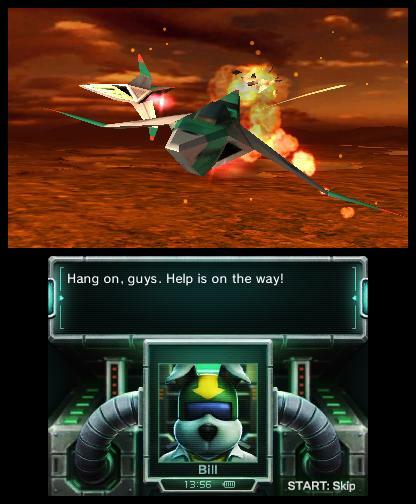 Pepper orders the mercenary Star Fox team, consisting of James McCloud, Peppy Hare, and Pigma Dengar to Venom to investigate. 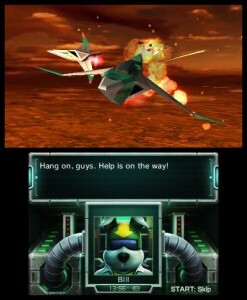 During this mission, Pigma betrays the rest of the team and allows Andross to capture them. James sacrifices himself in order to aid Peppy in his escape and is thus able to warn the general of what happened. Now, Andross has raised an army and declares war on the entire solar system. General Pepper enlists the help of the new Star Fox team in order to deal with this threat, now consisting of Fox McCloud, Slippy Toad, Falco Lombardi, and the veteran Peppy. Once the narrator concludes his exposition, and Fox receives his first mission, the game officially begins. Following the first mission, the plot may follow a different path depending on your performance in each stage, though all roads lead to the same place. Even better, most of the drama occurs during the game, so you don’t have to sit through cutscenes in between each mission and can instead get a feel for what’s going on while you’re playing the game. Not that the plot itself is particularly breakthrough or anything, but it’s about as good as a story about starship flying animals can be. And it’s certainly better than what any of the sequels have done since then. Aside from the main game, there is a score attack mode that allows you to replay any stage that you have previously completed in the main campaign and try to achieve a high score and earn medals. There’s also a training mode, which strangely enough, is forced upon you when you first start the game. Upon completion, it is then added to your main menu along with the aforementioned score attack mode. I thought this an odd decision. As someone who has played the original, I didn’t care to go through training again. At least it doesn’t last all that long and once you’ve done it once, it won’t ask you again. Returning from the N64 original is the battle mode, that will let you square off with three of your buddies. You have three variations to pick from. Survival is a last man standing match where the only person that doesn’t have their Arwing blown to pieces is the winner. There is also a point battle, which awards victory to the person who earns a set number of points. Time battle is very similar, except whomever has the most points by the time the clock hits zero is the victor. 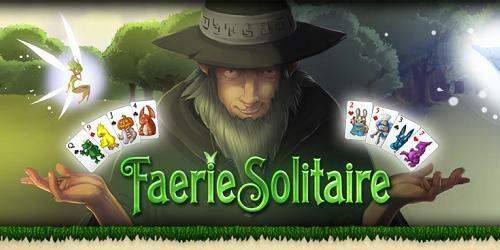 Even though there is no online play, you can play locally and with a single card if you want to. Also, the battle modes make use of the 3DS camera so other players can see live feed of your face next to the ship you’re flying around, which gives the satisfaction of seeing their shocked expressions when you blow them up. There are more stages to pick from in each mode now too, though the omission of the game type that required you to earn points by blowing up generic ships will be sadly missed. Star Fox 64 3D got a huge facelift over the jagged visuals of its N64 predecessor, and the extra polish really shines through. All of the polygons have been smoothed out and new details have been added to the stages, particularly those featured in the multiplayer modes. The Nintendo 64 was never really known for its realistic water effects either, so when you play a stage that really showcases these details, that’s when the game impresses the most. The final boss has also been prettied up, so if you’re a veteran of the original, you’ll appreciate how much better it is. The best part is, none of this is at the cost of performance, as I didn’t encounter any kind of lag or slowdown, even during the most hectic of battles. The one thing that wasn’t changed that looks especially dated and rather goofy is the speech animations of the characters. Their heads flop up and down really fast like Terrance and Phillip from South Park, and really looks out of place. I understand it was probably cheaper and easier to keep things as close to the original as possible, but it’s a bit of an eyesore that sticks out quite a bit. When I was younger and playing these games, I didn’t really have the appreciation for video game soundtracks in the same way that I do now. I would usually turn on the radio and blast my own tunes as background music to the chaos I was creating onscreen. Now having gone back and played this game, I actually noticed and paid attention to the music. My first thought when I heard it was that not only was it good, but it sounds very much like the kind of music featured in the Zelda titles. It was at that point that I had a “duh!”Â moment and figured out that Koji Kondo had composed this as well. If it’s any indication how superb his work is on this game, I think I’m adding Star Fox 64 to the list of soundtracks I now want. Another surprise came to me when I began hearing the familiar voices of all of the characters again. In some of the later entries in the franchise, all of the characters had been replaced, so it was refreshing to discover that nearly all of the original cast was included in this remake. When you listen to it though, aside from the improved sound quality, you’ll notice something was a little off. It turns out that not only did all of the cast return for this remake, but they re-recorded all of the same lines. For the most part, they sound just as cheesy and dramatic as they did before (which is honestly to the game’s benefit) but there are a few lines where they just couldn’t nail the same level of enthusiasm. In case you were wondering, Slippy sounds just as obnoxious as he always has. For newcomers, this old and reused dialogue may seem a little too cheesy and dated compared to what games offer today. And that’s completely understandable. Back in 1997 though, to have any kind of voice acting was a big deal, especially on a cartridge game. It also meant that the dialogue was limited, so your teammates will likely say the same things over and over again during a mission. And then again one more time. Falco may act like a jerk, but you won’t hate him for that so much as when he says, “Scratch one bogey!”Â for the 50th time. 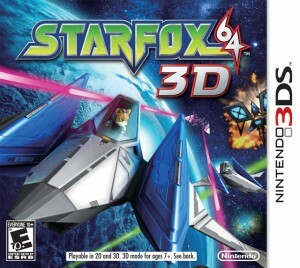 Star Fox 64 3D is a rail shooter, in that the camera will be fixated behind your ship and automatically move forward as you blast your way through the stage. Since the buttons are laid out much differently on the 3DS than they are on the N64, it may take some time to get adjusted. It seems like no matter which configuration you have, there is always at least one function that’s not in a convenient place, but that’s more a limitation to the hardware than it is to the game itself. The face buttons allow you to shoot lasers, launch bombs, break and speed forward. L and R tilt the ship in their respective directions and a quick double tap will perform a barrel roll. You use the thumbstick to maneuver the ship and the d-pad has some quick functions assigned to it that allow you to somersault or do a U-turn. The touchscreen on the bottom will show you the condition of your ship as continued damage will make you lose your wings and with that, any laser power ups you may have picked up. When the other characters talk to you, they will also show up down there. 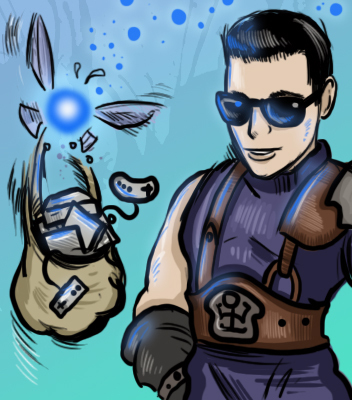 Sometimes ROB64 will try sending you a message and tapping the bottom screen will have him send you an item drop to pick up such as bombs or more health. Other relevant information such as your shield and your radar is on the top screen, and successful acquisition of three gold rings will extend the life of your shield for the duration of the stage. You can also switch on inverted controls or gyro controls on the fly. I expect many will leave the gyro controls off, however. Much like Mario Kart Wii and its plastic steering wheel thing, the gyro controls are merely a gimmick and a bullet point for the packaging and don’t perform well at all in the chaos of dog fights. Not only that, but reinforcing my criticism of Ocarina of Time 3D using them, moving the 3DS around when you have the 3D effect on skews your ability to see the action properly and everything ends in one big mess. If you have kids that you’d like to introduce this game to, they may enjoy tinkering with it. As for me, I turned them off at my first opportunity following the training mode. Not all of the game takes place on rails. Sometimes during certain stages or boss fights, you will be asked to switch to “All Range Mode.”Â This essentially creates a mini-arena of sorts for you to fly around in whatever direction you want. If you travel outside the confines of the area set aside for you, Fox will automatically do a U turn and return back the way he came. This mode is the most intense, as you’ll often be chasing behind enemies flying around the stage in order to shoot them down, or lose the ones that are chasing you. It also requires you to bring down the targets that you encounter rather than shoot what you can, ignore the rest mentality of the rails stages. The Arwing is the not the only vehicle you’ll be piloting though. You’ll also have access to the Landmaster Tank, which operates very similarly except you are kept on the ground. You still have the ability to hover by pressing the L and R buttons together and abilities such as the barrel roll are still intact. There is also a stage featuring the Blue-Marine which is a sub that can fire torpedoes at enemies, but not charge lasers. This vehicle is much less enjoyable though and you’ll be glad with how limited its use is. When you’re not saving your own skin, you’ll have three comrades that will fly beside you and will tend to get into some trouble themselves. As annoying as they can be, it’s in your best interest to help them as they each offer some benefit while they are around. Falco generally doesn’t get into too much trouble, but keeping him alive will allow him to show you alternate routes through stages, which is important if you want to unlock a particular stage or earn the true ending. Slippy will display the health level of the enemy boss characters you encounter, though he tends to get shot at A LOT. 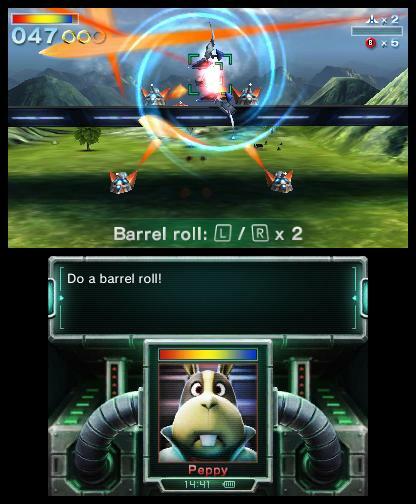 All Peppy is really useful for is telling you to do barrel rolls and stuff, though he may reveal enemy weaknesses, including that of the bosses. Their survival is also necessary for earning medals, so luckily they recharge some of their health after each stage. If you do happen to lose one, they’ll sit out for one level and return for the next. In an industry where any game that takes less than ten hours to finish is considered short, I think newcomers to Star Fox 64 might be a little blown away and perhaps disappointed that they can finish in one sitting. It’s made to be replayed though, as there are multiple routes to the end and depending on the order you complete the stages and your performance in them will unlock a better ending. Also, you may trigger events to occur in one stage that will directly effect another, possibly making things a bit easier on you. For example, defeating Star Wolf in the early going might prevent them from showing up towards the end of the game. There are also secondary characters that will randomly assist you on missions if you were successful in aiding them on a previous one. It’s a neat system, and it’s fun to go back through and see all of the possibilities for each route. When you begin the game, you have an option of playing in two different difficulty levels. The 3DS mode is rebalanced to take advantage of the new gyro controls introduced in this version (read: easier), though you don’t necessarily have to use the gyro if you don’t want to. The Nintendo 64 matches the difficulty with that of the original Nintendo 64 version and both modes have their own leaderboard that you can track scores with locally. If you’re really good, earning medals on each stage will unlock an expert difficulty setting to test your meddle in. Medals are acquired by accumulating a high score on a stage as well as keeping all of your teammates alive. It’s no small feat, even on the easier setting. You can also earn them in the score attack mode, which should keep you entertained as well. Despite a few extra options in the multiplayer mode, it was disappointing to see that it was local only. This was a huge missed opportunity in terms of extending the life of this game and letting consumers know that Nintendo does in fact take the internet seriously. You can battle against CPU opponents if you don’t know anyone in close proximity with a 3DS, but that’s no substitute for the kinds of intense dog fights that can occur in an online arena. This is a difficult area to judge as someone who sunk many hours into the original, though as an aside, I noticed my skill in this game has degraded quite a bit since then. Even so, the game saves your progress after every stage, though you can only have one save that constantly overwrites itself. I was able to earn an extra life after every level in both the 3DS and N64 difficulty levels and I never had to use any of them. If by some tragedy I had managed to burn through them though, there’s also the option to continue after all the lives are exhausted. I fully expect even the least experienced player should at least be able to get through it. Earning medals on the other hand, now that is a challenge. Even though there are selectable difficulty levels, the route you take through the stages is displayed using a different colored line. This line is an indication of the difficulty of the path you choose. For example, a blue line indicates an easy route, red is the most difficult, and yellow falls somewhere in the middle. If you don’t go out of your way to find an alternate route through a stage, most likely you’ll follow the blue path by default. If you’re gunning for the real ending though, red is the way to go, and if you fail in discovering the correct path in a stage, a retry is only a ship sacrifice away. 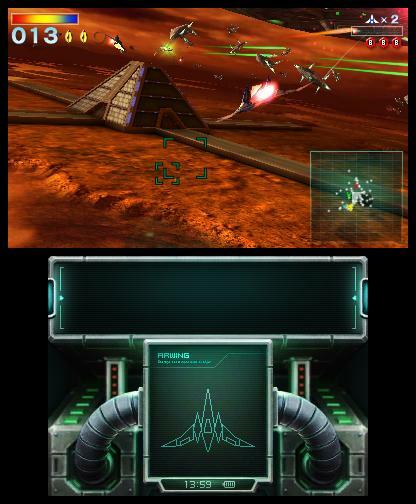 While everything in Star Fox 64 3D has been given a new coat of paint, it’s hard to look past the obvious: it’s far cheaper to obtain a different version of this game and still have a very similar experience. If you own a Nintendo 64, a used cartridge won’t run you too much and even the digital Virtual Console version on the Wii only costs $10. The 3D effects are cool and what few added features there are make a nice addition, but I don’t think any but the most dedicated fans of the original title will feel that it is worth $40 to buy this game again. Since I willingly shelled out to own this game, I suppose that puts me in that category too doesn’t it? Despite being a fourteen-year-old game, the gameplay has aged well, and I had just as much fun as I did as a kid, firing this up on the Nintendo 64 for the first time. Nostalgia is a very powerful tool when it comes to resurrecting old titles, and it just so happens that this game is still fun after all this time. And chances are, if you liked the original, you’ll have a lot of fun too. If you’re looking for new stages or any significant changes though, you’ll be very disappointed. There’s a reason why I think Star Fox 64 is the best game in the franchise: it’s so incredibly polished for a rail shooter. Gameplay is intense and forces you to not only watch your own back, but that of your teammates. Every level is diverse not only in terms of theme, but offering unique challenges such as warding off enemies before a bomb explodes, blowing up a train before it has a chance to escape, or avoiding spotlights as not to alert enemies to your presence. And if that wasn’t enough, being offered different vehicles on occasion further adds to the variety. This is the kind of game where the term “short, but sweet”Â is most defining. It’s not a long game, but it’s fun while it lasts and subsequent trips through it end up being just as enjoyable as the last. 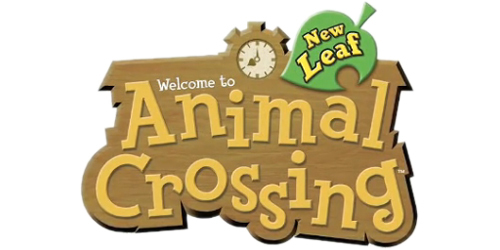 I hate making blanket statements about a market, but if you bought a 3DS just to play Nintendo first party titles, then chances are, you had your eye on this title the moment it was announced. If you haven’t purchased and played it already (or perhaps are even waiting for a price drop), you might be wondering if an upgrade to this version is worth it. If you’re still content with the original and the dated graphics don’t bother you, then probably not. It looks better than the original, adds a few bells and whistles, and that’s about it. If you’ve never played this version of Star Fox or any game in the Star Fox franchise for that matter, then this is a great entry point. It has held up better than the SNES version, and all of the sequels introduce at least one or two gimmicks that drag their respective experiences down. In fact, I hope future titles in the franchise will build on this experience. While the 3D effect looks great, I wasn’t nearly as impressed as I was with Ocarina of Time 3D. I think part of it is because the 3D gimmick has begun to wear away its fascination for me, but also because that title was all about subtlety. The things that looked most impressive were the small details such as lens flares, whereas Star Fox everything that happens onscreen is right there in your face. Don’t get me wrong, I liked the effect and kept it on during the entirety of my experience with it, but the same level of “wow”Â factor just wasn’t there. One of the things that made the original Star Fox 64 so popular was that it was bundled with the Rumble Pak and was the first console game that I can recall that utilized force feedback. And boy, did that game use force. Whenever you defeated a boss, the controller would practically jump out of your hand it rumbled so hard and it wouldn’t be long until Sony began integrating the technology into their Dual Shock controllers. If Nintendo wanted to release a rumble peripheral for the 3DS, this would’ve been the perfect game to showcase it, much like the one included with the DS version of Metroid Prime Pinball. I was really hoping for a little more content with this release. A new stage, online multiplayer, some kind of epilogue chapter; all of these things would’ve truly added something fresh to the experience. In its current condition, it feels like Nintendo has gotten complacent with simply prettying up a game and charging full price for it without doing anything meaningful. How about a soundtrack for pre-ordering for your most dedicated fans? 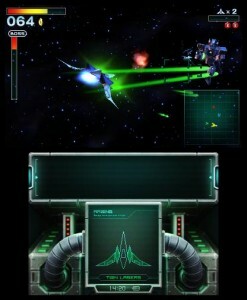 Or even better, how about the unreleased Star Fox 2 as an unlockable? How sick would that have been? It would never happen, but it never hurts to dream big. Star Fox 64 3D is largely the same game as the Nintendo 64 classic it is based on, complete with all of the stages, gameplay, and even the original voice actors still intact. For veterans looking for a dolled up version to take on the go, this is a perfect addition to their library and it’s the perfect entry to introduce to newcomers of the franchise. For everyone else, very little was added aside from the new gimmicky gyro controls, ability to save your game, and single cart multiplayer. There are no new stages, no online multiplayer, and a scarce number of additional modes. If you’re on the fence about it, it might be worth holding off for a cheaper price. It’s still just as fun as it was 14 years ago, and is the best Star Fox game to come out since the first release of Star Fox 64.